Okotoks Chiropractor Dr. Donald Hogue (Dr. Don) is very excited to be reunited with Dr. Brad Harper at Healing Hands Family Wellness in Okotoks. 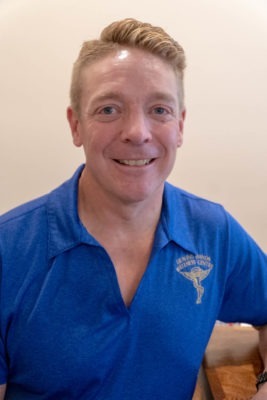 Dr. Don was raised in Lethbridge and graduated from Western States Chiropractic College (now called University of Western States) in Portland, Oregon in 1991. Following graduation, he joined Dr. Brad in Coaldale, Alberta. Dr. Brad was very supportive during Dr. Don’s studies and was a wonderful mentor during his first years of practice. Dr. Don moved his practice to Lethbridge in 1995 and has been practicing there ever since. Dr. Don treats all joints of the body from head to toes with hands-on adjustments and Activator instrument adjusting. Dr. Don also takes a keen interest in the “Body-Mind Connection” based on the philosophy of Louise Hay. This allows people to explore how long-held emotional patterns can affect their physical health as well. In addition to Chiropractic, Dr. Don and his wife Lisa created LifeWorks International.ca in Lethbridge. They facilitate transformational workshops and retreats across western Canada and some tropical destinations. They have extensive training with Insight Counselling and Training and Louise Hay’s Foundation as well as years of experience coaching, mentoring and supporting individuals and groups. Dr. Don feels truly blessed to have witnessed so many people transform their health through Chiropractic and their lives through personal growth. Dr. Don is ready to help you! To learn more about Healing Hands Family Wellness or to book an appointment with Okotoks Chiropractor Dr. Don Hogue, DC, we invite you to contact our office – we look forward to hearing from you!